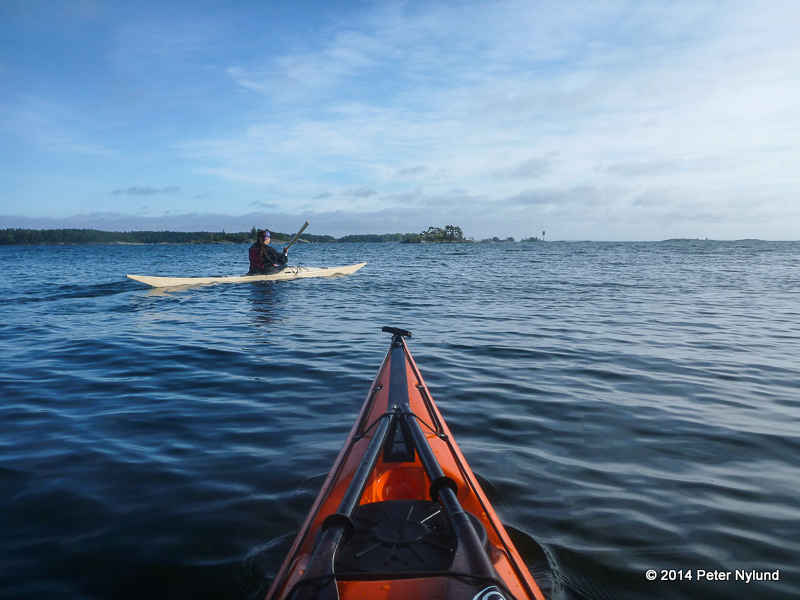 Outdoor activities in Finland and Scandinavia. 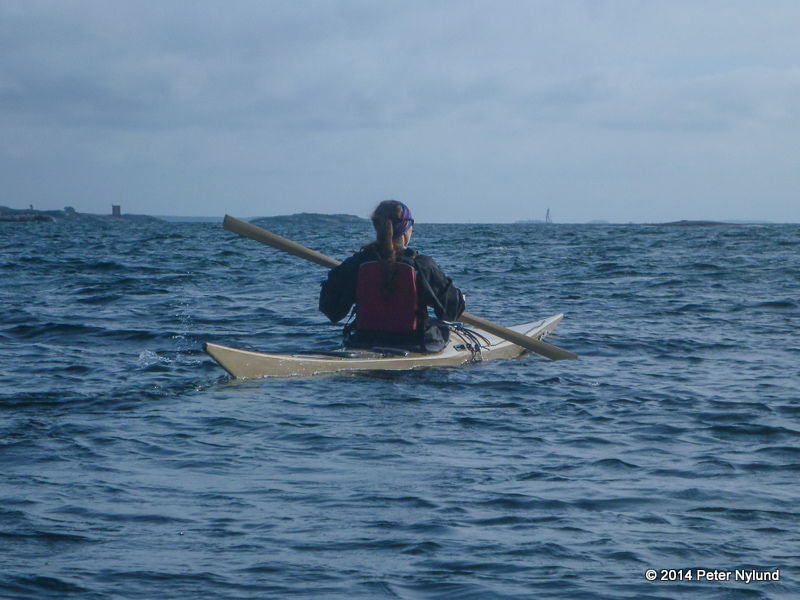 I had planned to go with Vigu course mate Anna on a kayaking overnighter to celebrate her finishing her new kayak, which she built entirely herself. 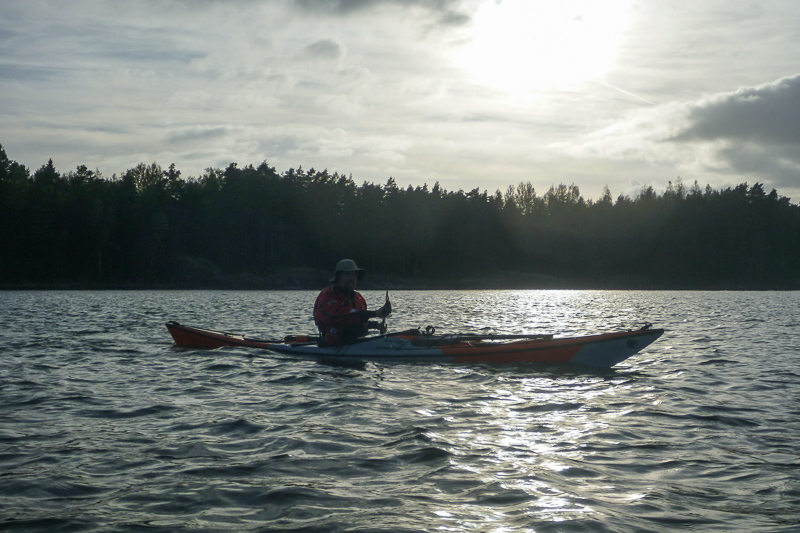 For different reasons, the overnighter was changed into a day trip, but as an added bonus I had a new kayak myself, bought the day before. 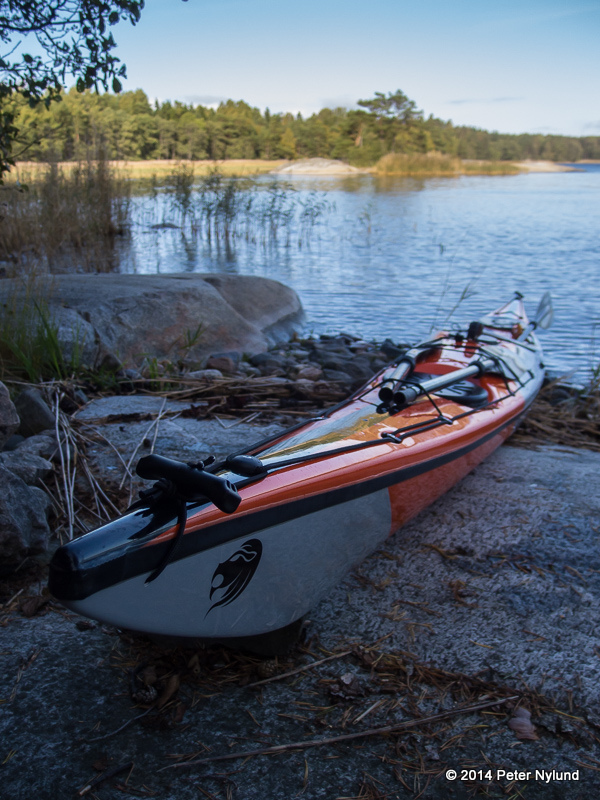 While I've been quite satisfied with my Prijon Kodiak kayak for overnighters and longer trips, where it really excels, I've been checking out potential other kayaks now for two months. 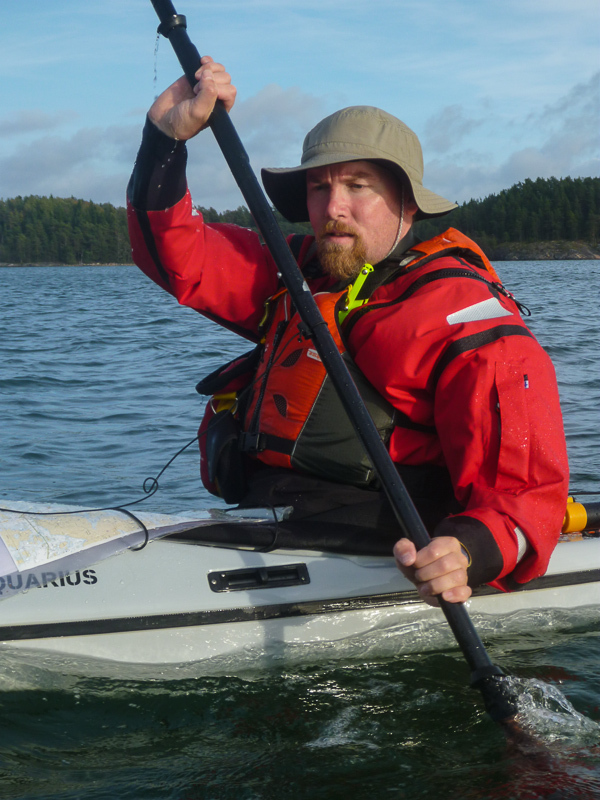 My interest is currently kayaks of the British style, since I want to learn the advanced techniques of that particular style, since it becomes increasingly clear to me that I will do my main specialisation of the Wilderness and Nature Guide studies in sea kayaking. 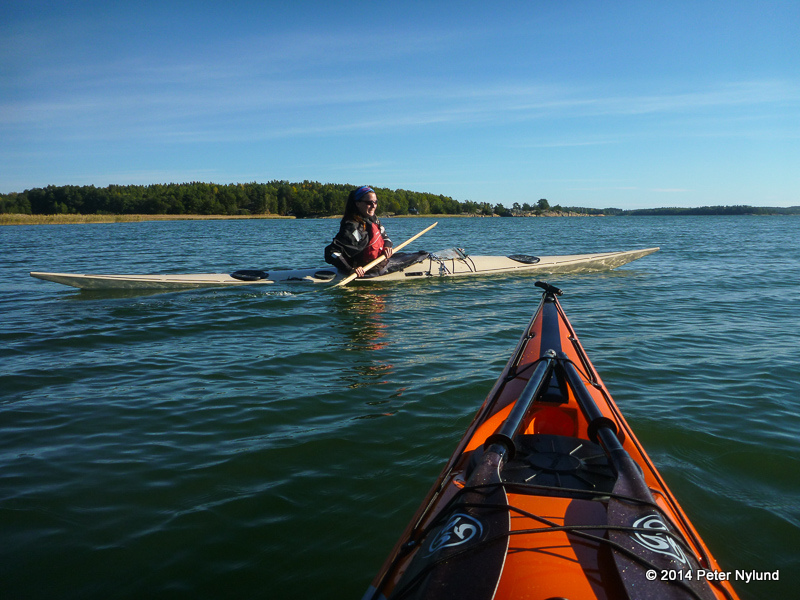 While the Prijon Kodiak still is fairly nimble for its size with the rudder up and with no extra load, it is still a still more of a battle ship than ballet kayak. Hence I started looking at other alternatives. 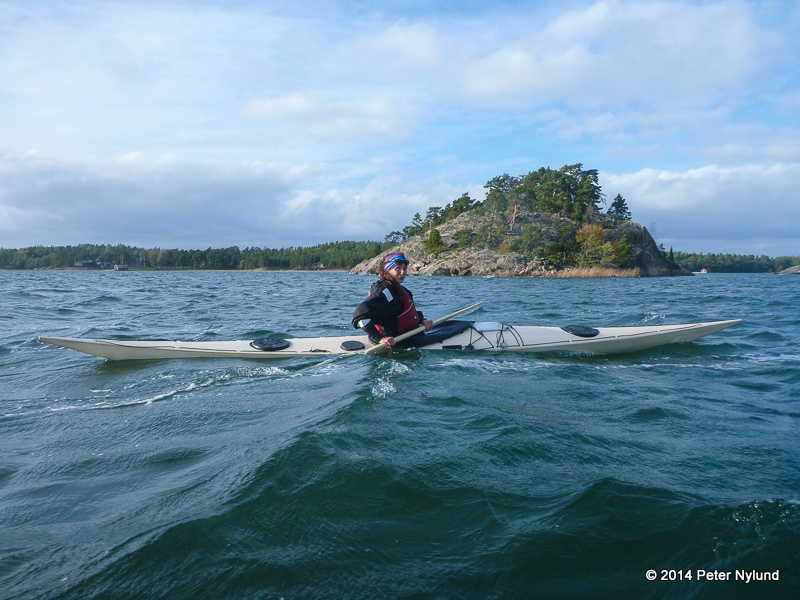 I tested a Seabird Scott HV, which I liked a lot. It was very manouverable and not too expensive, but it was a bit heavy and floated a bit high unloaded. The MV version could probably have been nice, but I didn't test it. 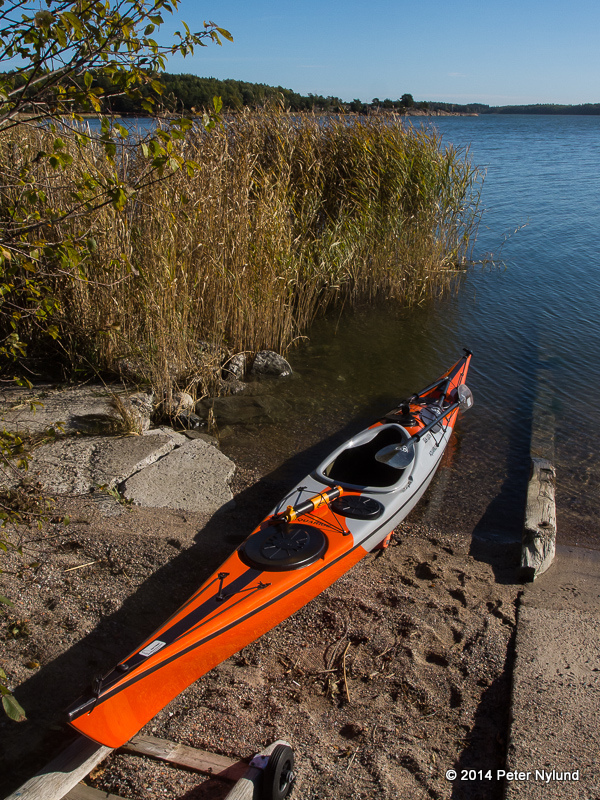 Other interesting kayaks on paper was the Tahe Reval HV, which wasn't available in Finland and then a bunch of more expensive kayaks like the Valley Etain 17.7, Tiderace Xplore L and P&H Cetus HV. I tested sitting in the Cetus MV, but it was a bit short for my long legs. The HV version might have been ok. 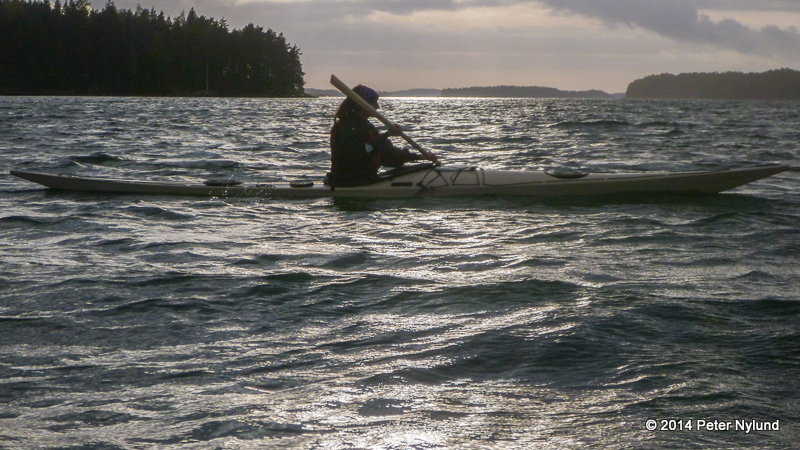 I also started to think about getting as small a kayak as possible, for technique practice and such, and to keep the Prijon Kodiak for now when more load capacity was needed. 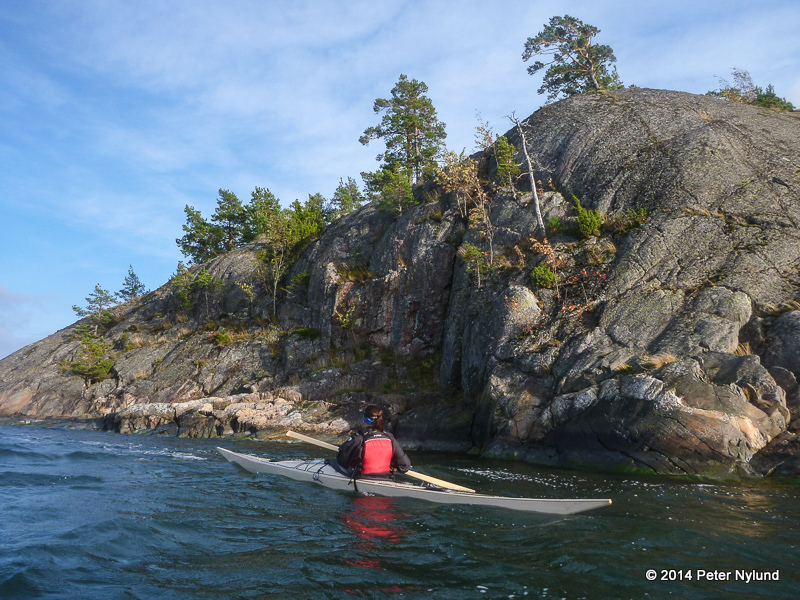 I visited Bear&Water, the biggest kayaking shop in Finland, to check out more alternatives. The Valley Etain 17.7 wasn't really big enough for me. The knee braces were placed in the middle of my thighs, which was quite uncomfortable and the cockpit could have been a few cm longer to make it easier to get in with my long legs. 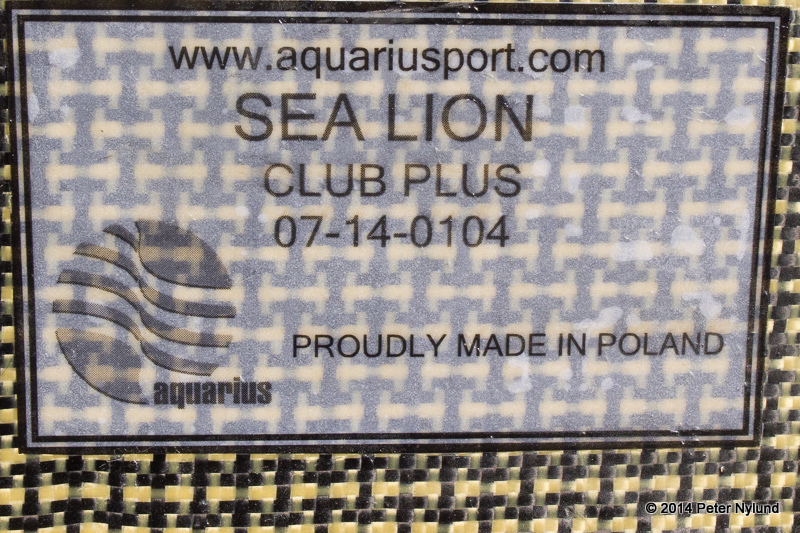 I was then shown an Aquarius Sea Lion, from a less known Polish manufacturer. 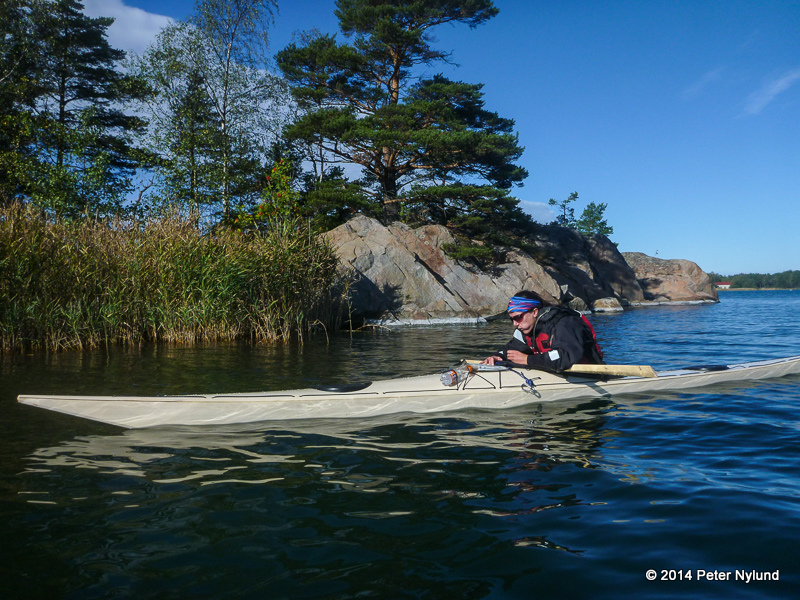 It is on paper a very tempting British style kayak: It is half the price of the expensive British kayaks and with a kevlar/carbon construction very light, around 22-23 kg, which is a definite advantage. 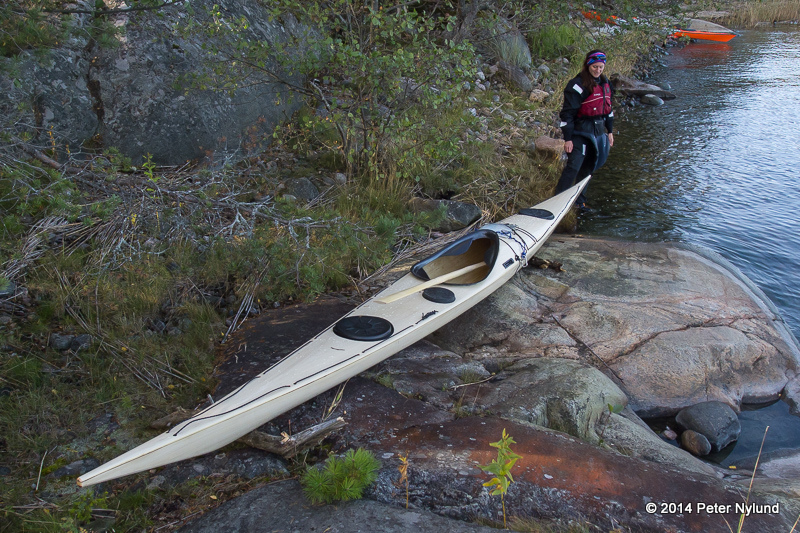 It is about the smallest volume kayak that I can get into, but there was plenty of space for my legs. I could get my legs after having seated with some difficulty and a few cm of cockpit length would have been nice, but it seemed very nice and I bought it. 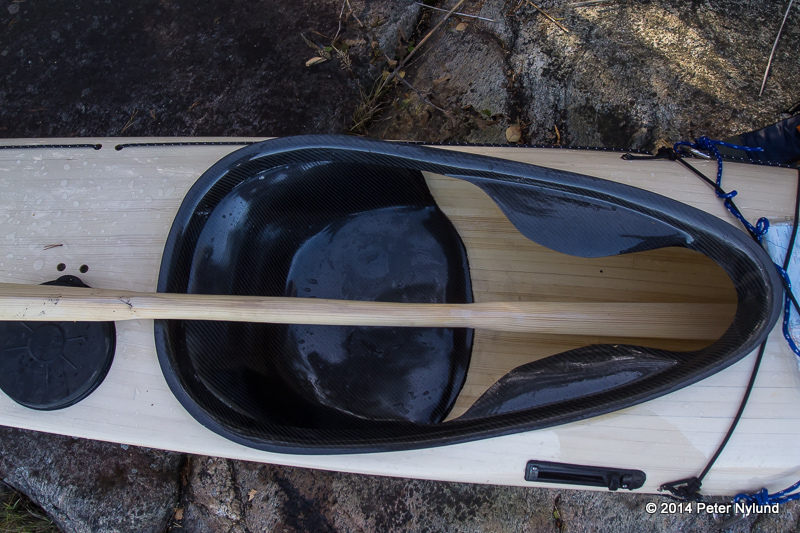 A first short test paddle was very encouraging. 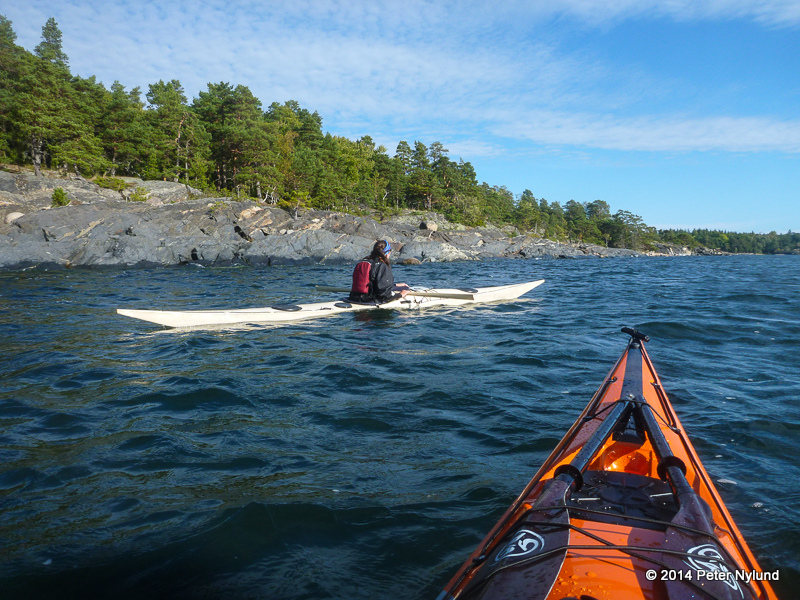 I took the car with both our kayaks and Anna to Granvik, which in the relative hard wind was a good starting point. 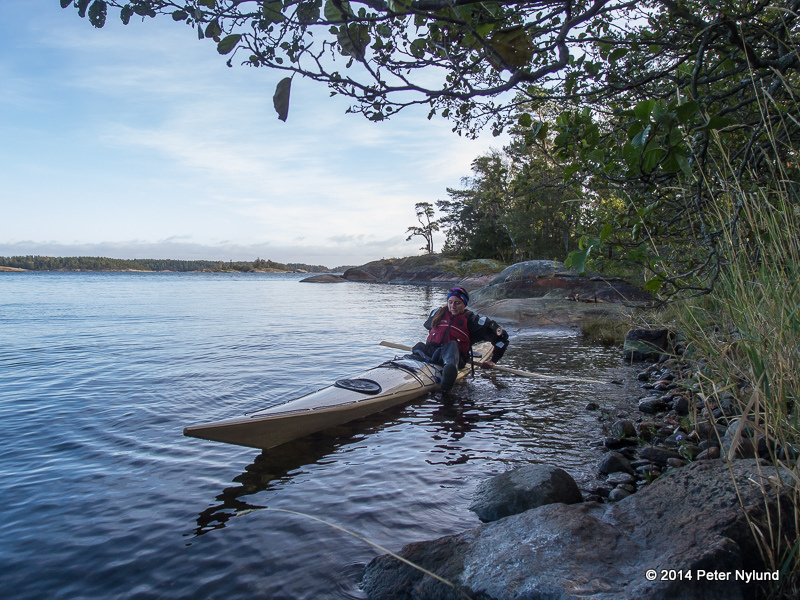 Anna's exciting first moments in her new kayak, which she had spent almost a year building. 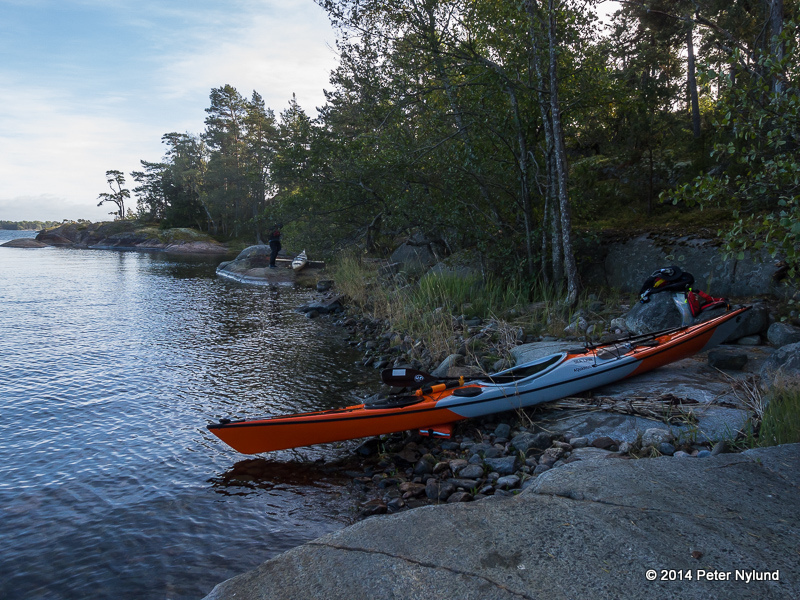 A short break after an hour, sheltered from the strong wind by an island. 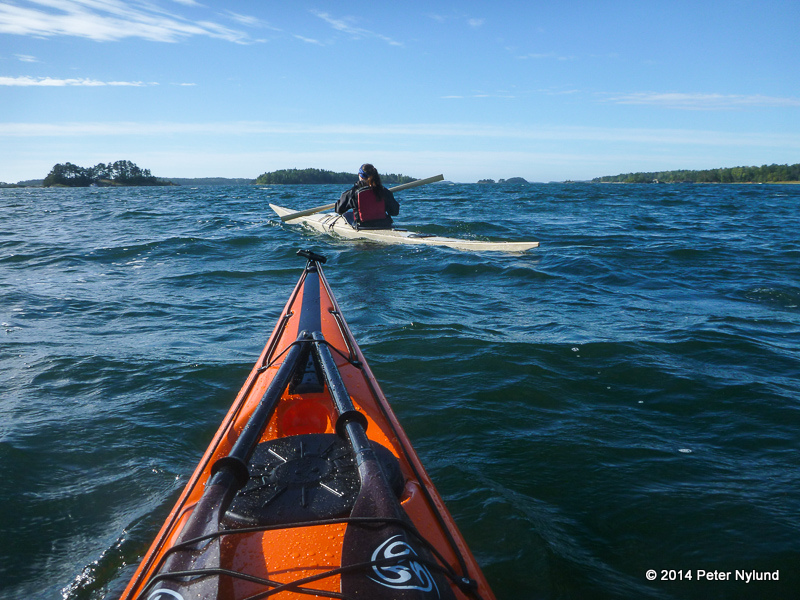 My new kayak felt a lot more lively than the Prijon Kodiak. 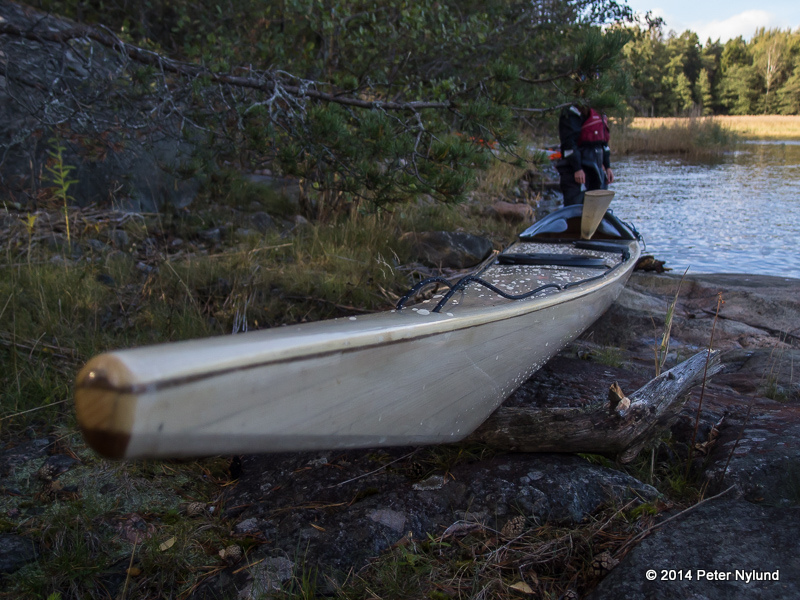 With a width of 52 cm compare to the 59 cm of the Kodiak it was also a lot less stable. 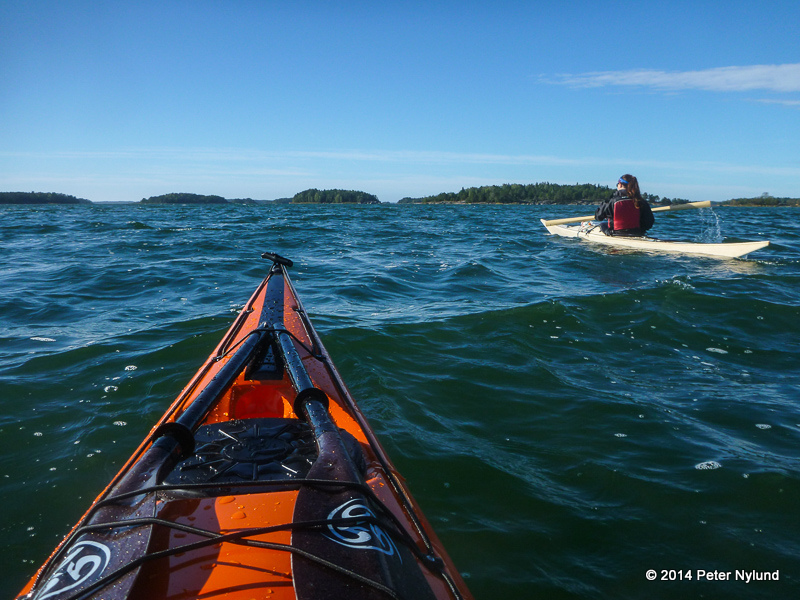 Closing in on our lunch site, Trollö. 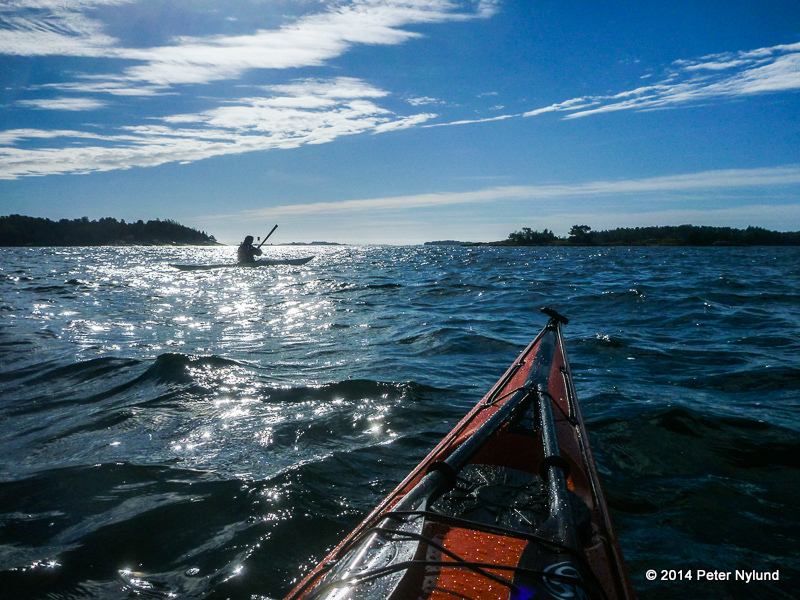 The sunny side was to windy and exposed to land on. 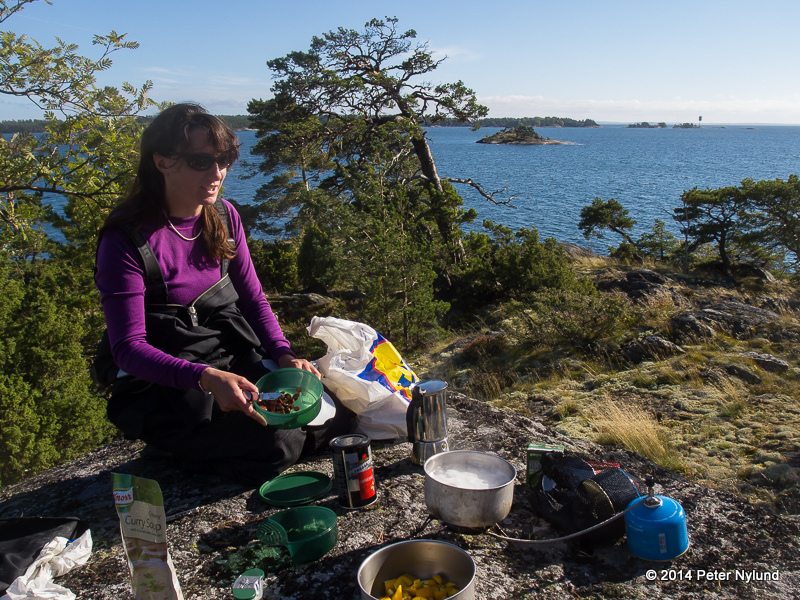 After lunch we went looking for a Giant's kettle, which Anna's map showed with a precision of a kilometer or so. I had a marine chart, which showed almost nothing of what's on land. 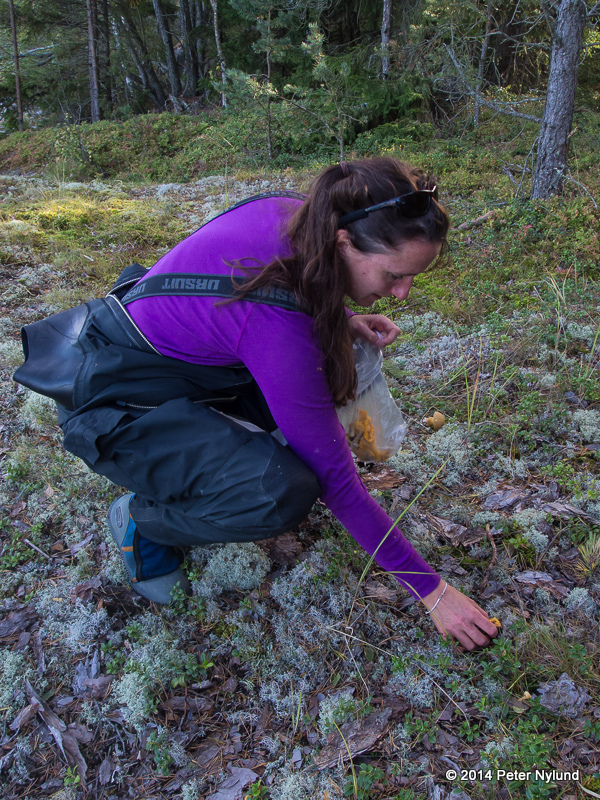 We failed to find it, but some late chanterelles compensated for it. 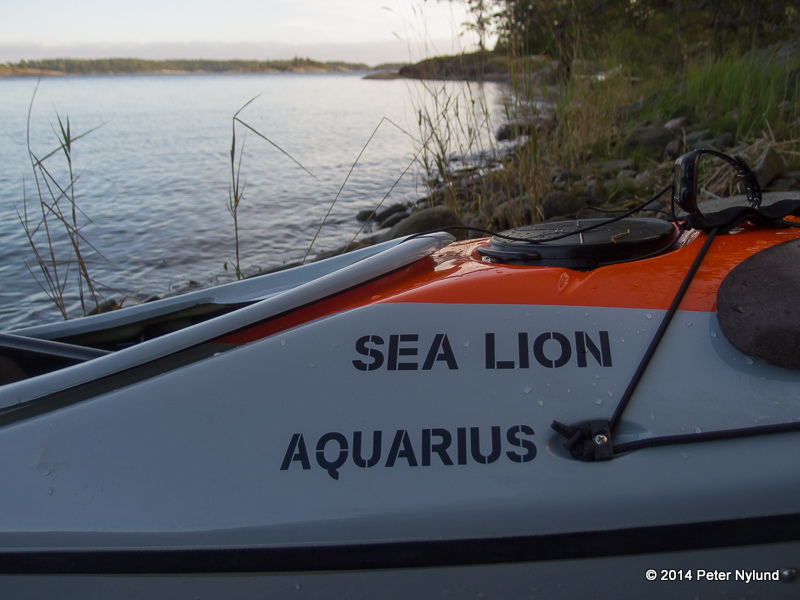 I think the Sea Lion is a quite good looking kayak. 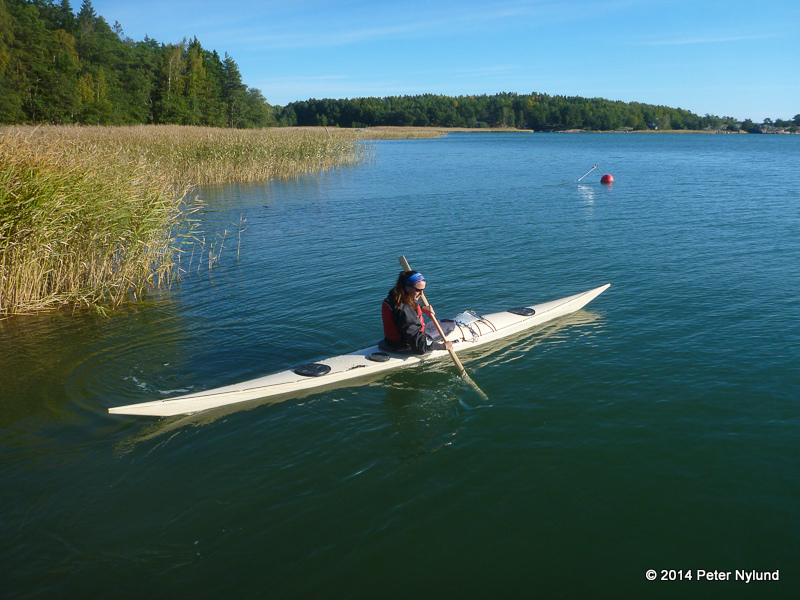 This one is proudly made in Finland by Anna. 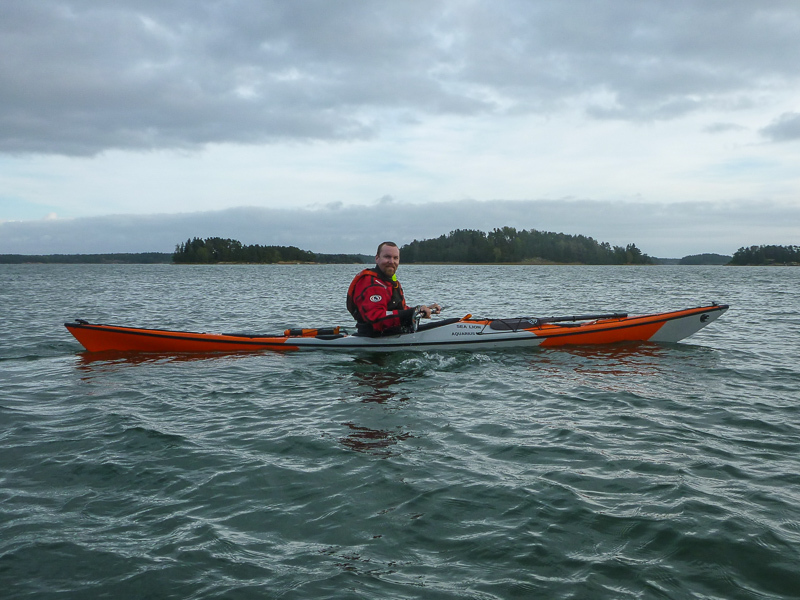 It is an East Greenland style kayak, the design is a Hunter by Björn Thomasson. 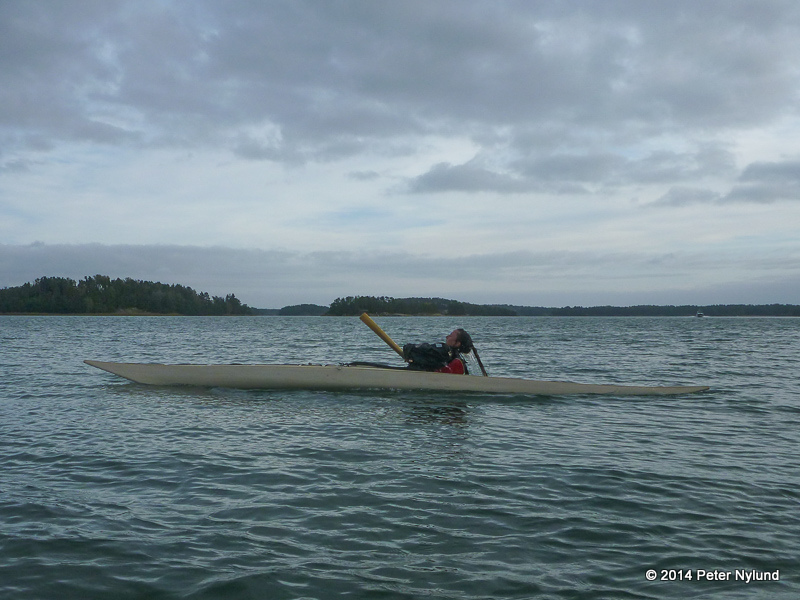 The woodstrip construction method makes a beautiful kayak, while being strong and light (< 20 kg). The seat design is very nice and interesting. 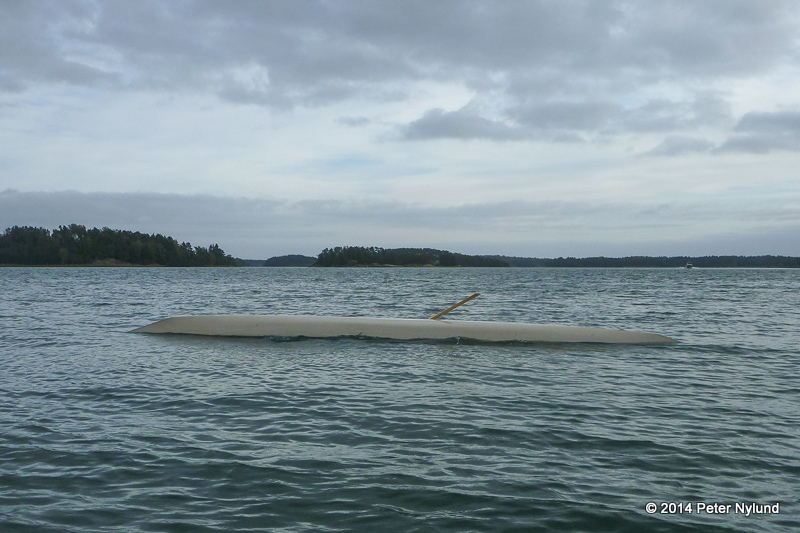 It is made form carbon fibre and fits tight against the hull, thereby minimizing the amount of water that can enter in case of a capsize. The knee braces seem a bit aggressive, but they can be reduced if needed. Anna tries out some stuff. 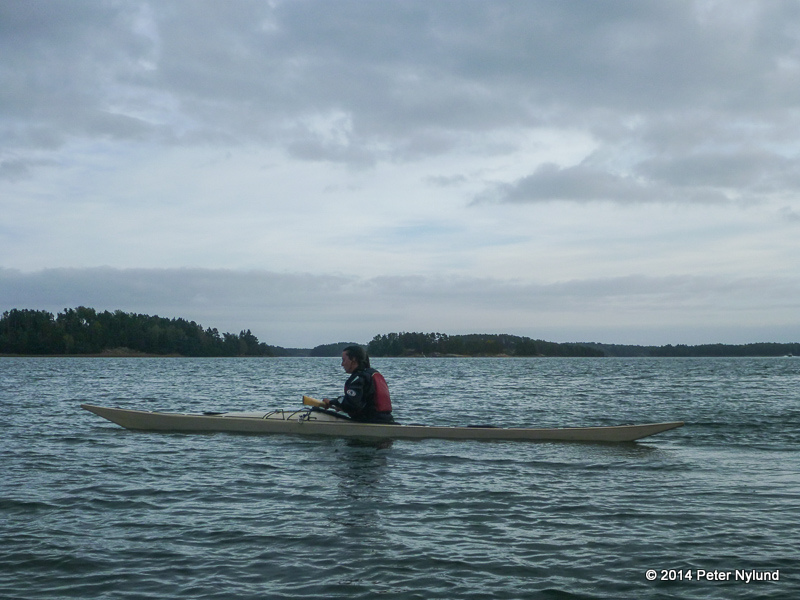 It was fun to test my kayak as well. I think it manouvers really well. A bow rudder with some edging really had effect, as opposed to in the Kodiak. 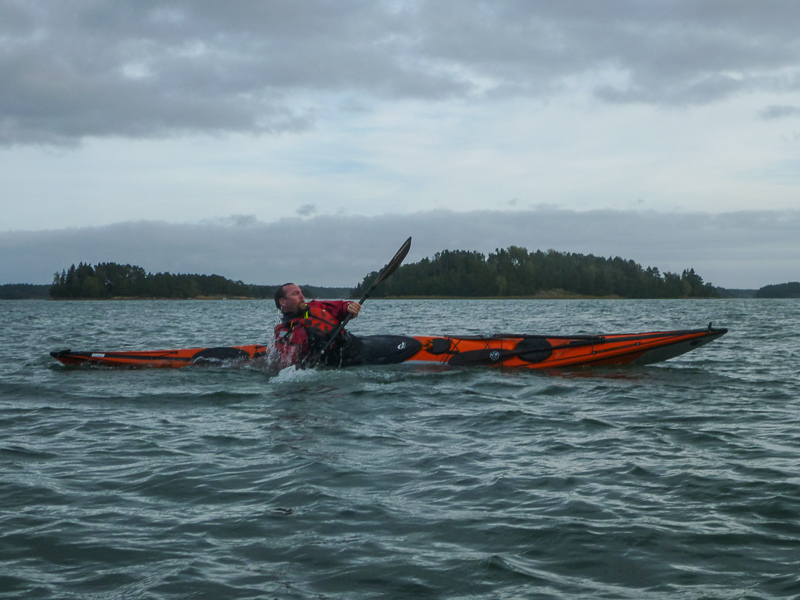 When going about 45 degrees against the wind I noticed that having the skeg suitably engaged, I could turn the boat but simply leaning forward and backwards. 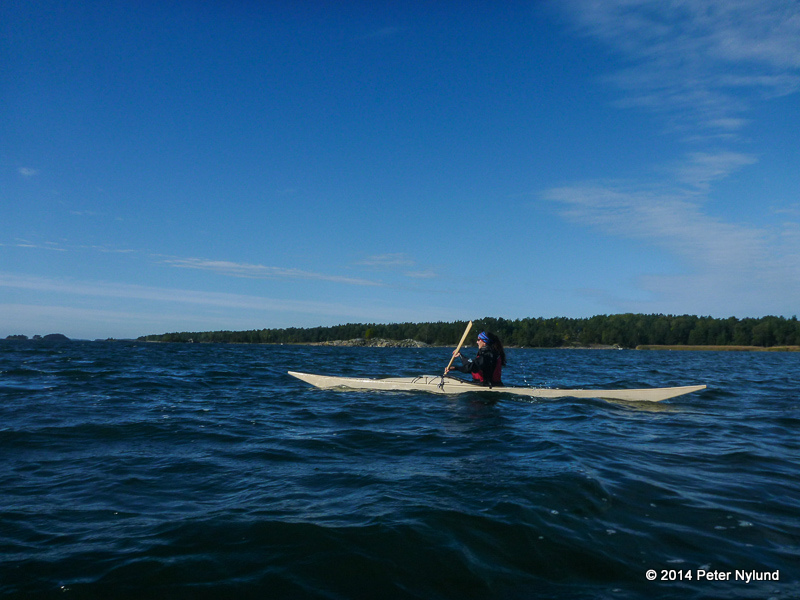 Leaning forward puts more weight on the front, which then is tighter in the water, while the wind affects the stern. And vice versa. 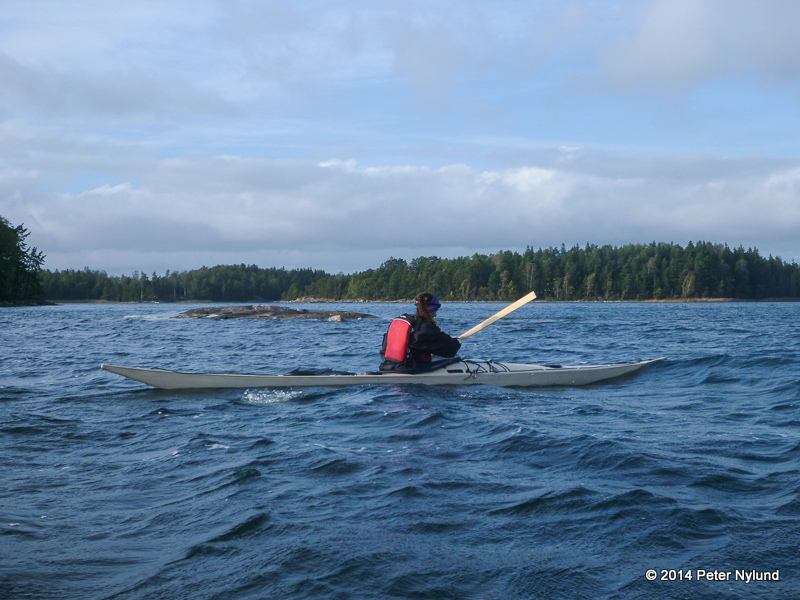 Paddling back with tail wind this time. The waves were not big enough to give any real surfs, though. Some pictures of yours truly by Anna. Almost back after 20 km. 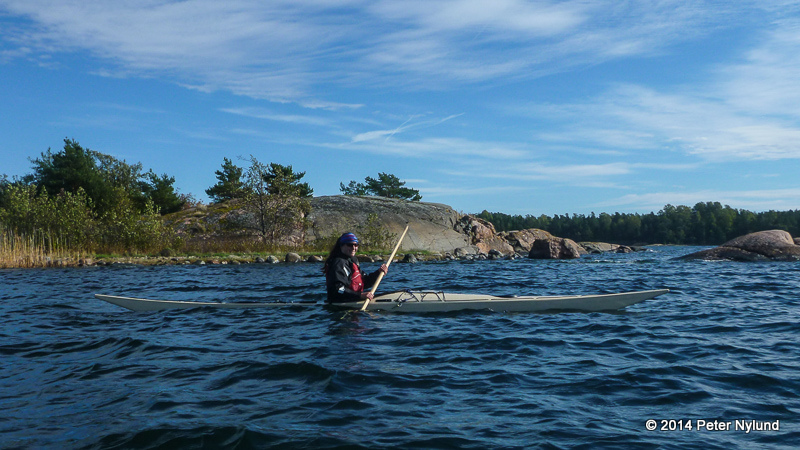 We put away some stuff like mobile phones and headgear, before doing the first rolls with the kayaks. 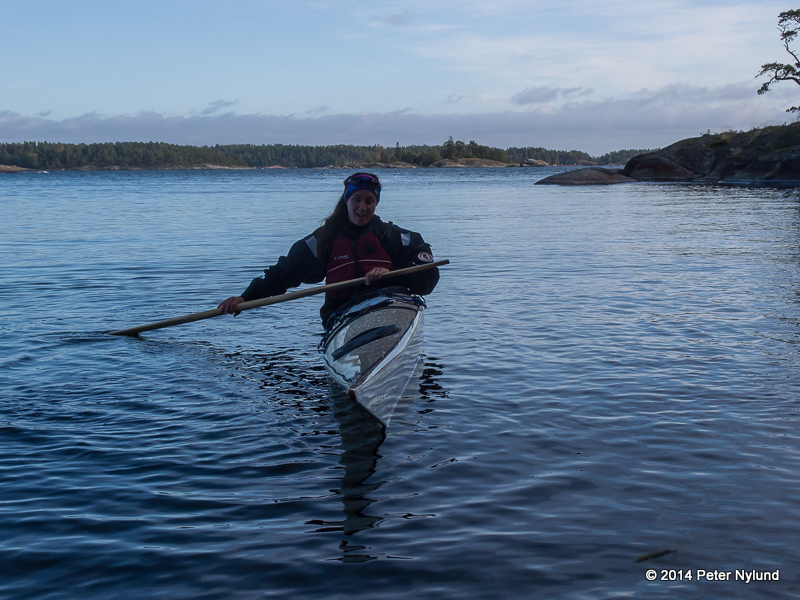 Anna waits for the water to get warmer. Or something. 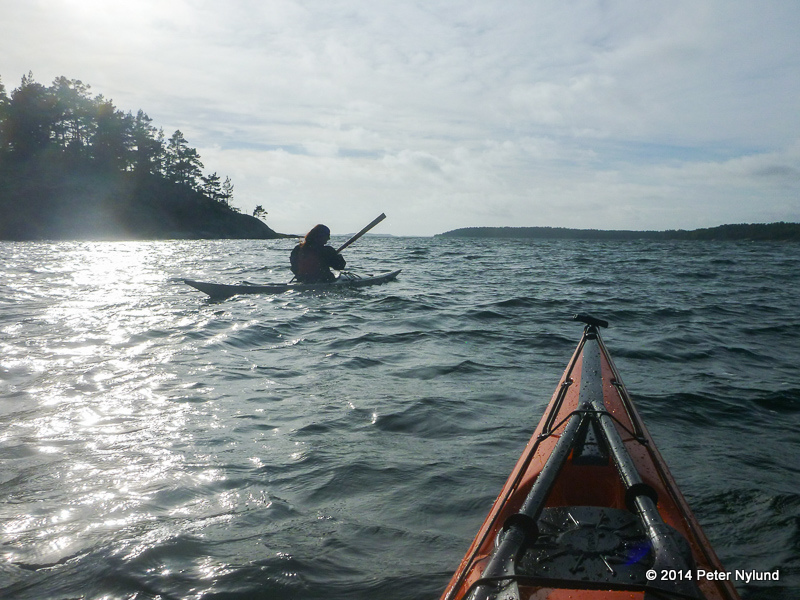 She decided to show how nice the bottom side of the kayak is. And there it is. 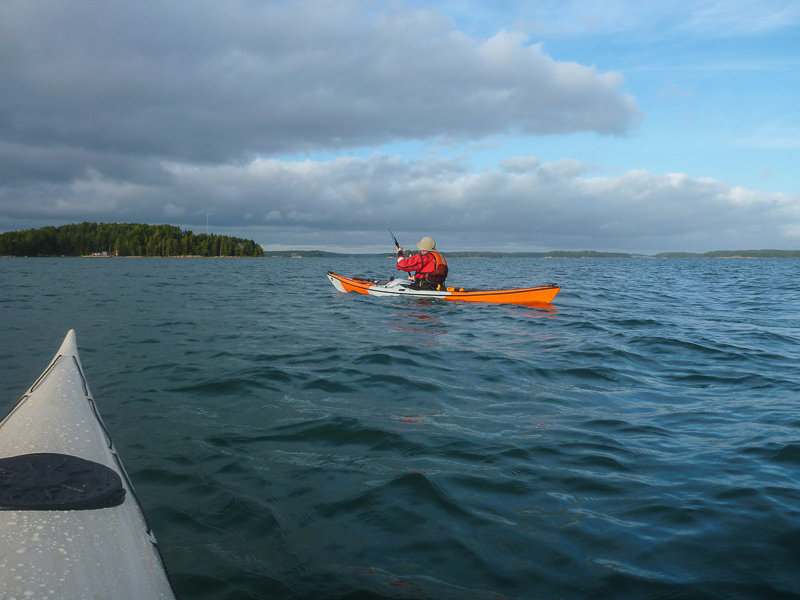 The first roll with the new kayak. My turn (photos by Anna).